The year’s final major will be contested at Baltusrol Golf Club for the second time in the club’s history this week. Baltusrol is one of a group of new and lengthy courses added to the PGA Championship course pool in the decade from 1999 to 2008. At a par of 70 and stretching out to 7428 yards on the scorecard, Baltusrol fits in well with these new courses which have universally been stretched out longer than average. Baltusrol and others have cemented the PGA Championship as year-on-year the longest of the four major championships. The most important factor in the length of a course is typically the par. The difference between a par 70 with two par 5s and a par 72 with four par 5s has measured about 170 yards between 2012 and 2016. In this piece, I’ll be referring to relative length which is just the course’s scorecard length minus the average scorecard length for that par of course in the group of seasons around when the course was played. For example, Baltusrol’s relative length is 258 yards – 7428 yards on the card minus 7170 for the average par 70 from 2012-16. In the 1980s and 1990s, the PGA Championship was already the longest of the majors. On average the relative length of their courses was about 100 to 125 yards. During this time the Open Championship and U.S. Open measured about 50-100 yards longer than average and the pre-Tiger proofed Masters was the shortest at about 100-150 yards shorter than average. The PGA’s distance surge comes at the same time course lengths have increased overall to cope with modern technology. 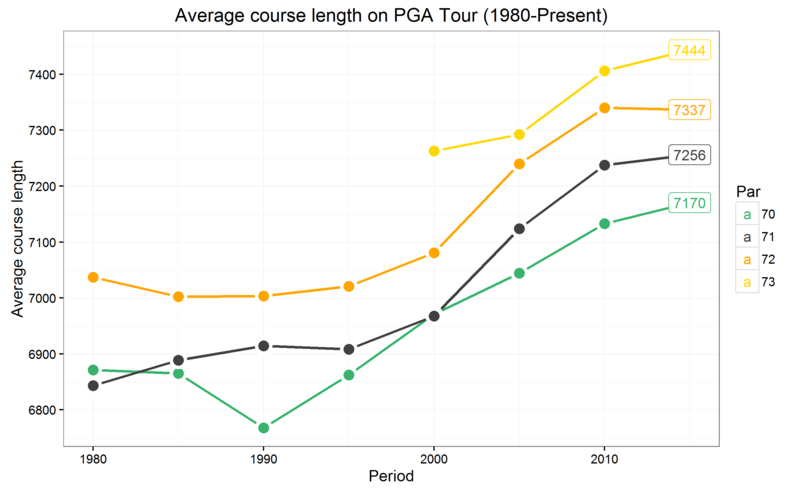 The average course length has shot up by around 300 yards since 1980. But the increase in PGA length has come even on top of that global increase. The PGA of America has since made the move to add lengthier courses, while dropping out some of the shorter venues. Crooked Stick (+201), Bellerive (+239), Valhalla (+123), and Medinah (+321) were added in the 1990s while Riviera (+48), Sahalee (-65), and Winged Foot (+16) did not get another PGA. The PGA added a string of former U.S. Open hosts with Hazeltine (+120 and +334 for the 2009 PGA), Baltusrol (+348), and Oakland Hills (+262), and they added newer massive courses with Whistling Straits (+274 in 2004) and Kiawah (+339). In total, 12 of the 20 events from 1996 to 2015 were played at courses which hadn’t hosted a PGA before 1996. Those 12 events over six new courses measured 233 yards longer in relative length. That doesn’t count the two 250+ yard behemoths that were returned to the schedule after several decades: Atlanta Athletic Club and Oakland Hills. The U.S. Open has added similarly long venues with Torrey Pines and Chambers Bay, but these new additions have been rarer and are also balanced by continuing to schedule shorter courses as well (Merion, Pebble Beach, Olympic Club, Shinnecock, etc.). In total, the last ten PGAs have been played on courses 150 yards longer than average 8 times versus 5 for the U.S. Open and zero for the Open and the Masters. The PGA Championship has been criticized for lacking an identity. The U.S. Open is hard, the Open is on links land, and the Masters is the Masters. Perhaps the PGA of America’s strategy of embracing the 500 yard par 4s and 220 yard par 3s of these longer courses will cement it as the major most suited to the modern day bombers. That has borne itself out in the stats. 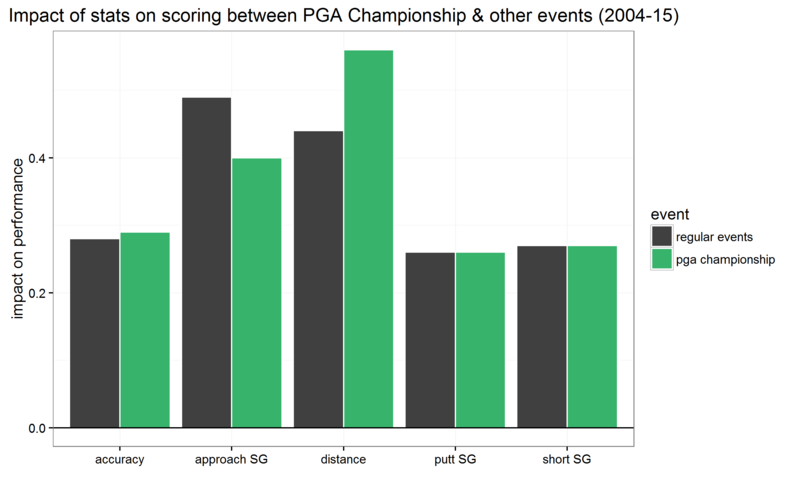 When comparing what factors (distance, accuracy, approach play, short game, putting) have been important for success at the PGA Championship versus in other Tour events over the last twelve years, driving distance stands out as the major differentiating factor. 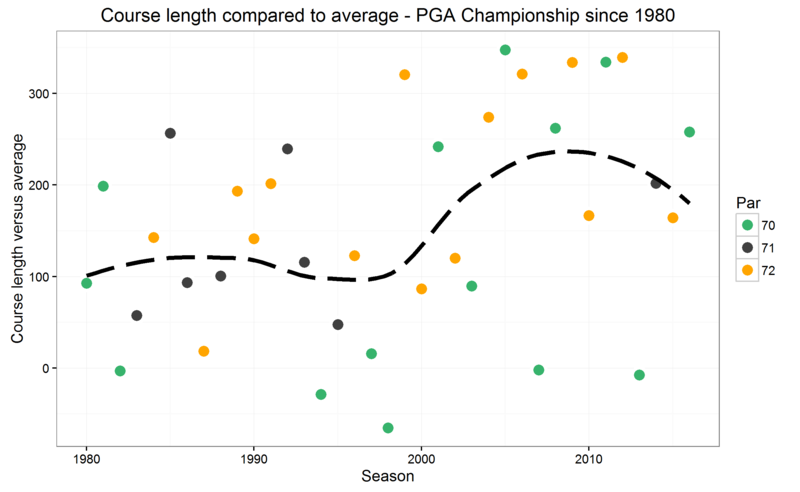 Long hitters have thrived at the PGA Championship to a greater extent than in other PGA Tour events. That’s one of the reasons that Rory McIlroy has dominated the PGA Championship to such an extent. In seven career PGAs, he’s won twice, finished top 5 another two times, and added another top 10. What population are you using for “success”? Top 10 finishers, winner only, etc. We used the full population of players who played in a PGA Championship. So, success = performing highly at the event.